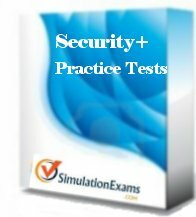 SimulationExams.com released the new Comptia Security+ SY0-401 practice tests recently. The practice tests consist of 300+ most relevant questions with answers. Flash card explanation is available for all the questions. Free Security+ cram notes is available for download. View free Security+ practice questions or download a trial version of Security plus practice exam with 30+ free questions. The exam engine provides a rich experience with several configurable option. Some features include bookmarking, exam review, saving the results, etc. Other practice tests offered include CCNA, CCENT, A+, Network+, PMP, ITIL, and others. About Security+ Certification: The certification is offered by CompTIA(R), and is widely accepted in the area of computer and networking security. It is a vendor neutral entry level certification. 1. What are the exam objectives (new)? 2. What are the prospects for Sec+ certified candidates? The job positions may include systems security administrator, network security administrator, IT infrastructure security administrator, etc. 3. How long Security+ the certification is valid? Usually, CompTIA certs are revamped after every 3 years. Though there is no expiry date as of this writing, expect a revision within next 3 years. You may need to recertify to keep the certification credential valid. There are no pre-requisite conditions for appearing for the exam. However, it is recommended that you have atleast 6 months of experience in related fields. SimulationExams.com released cram notes for CompTIA Security+ Exam SY0-301. The exam syllabus includes Network Security, Compliance and Operational Security, Threats and Vulnerabilities, Application, Data and Host Security, Access Control and Identity Management, and Cryptography. Exam Simulators: CompTIA A+ Essentials Practice Tests, CompTIA A+ Practical Practice Tests, Cisco CCENT Exam Sim, ICND2, CCNP Route CCNP Switch, and others. About Security+ Certification: Security+ is a certification sponsored by CompTIA, the Computing Technology Industry Association. Security+ is offered by Comptia Systems on successful completion of SY0-301 exam. The Security+ Certification shows that you have the competence required to implement security tools, and procedures to react to security threats as well as anticipating security risks and guarding against any incidents before they occur. It is an entry level cert and among the most widely recognized certifications in the world. The course is considered to be one of the leading vendor-neutral certification for security professionals. Disclaimer: Simulationexams.com is not associated or affiliated with CompTIA or any other company. SimulationExams.com is a group website of Anand Software and Training.